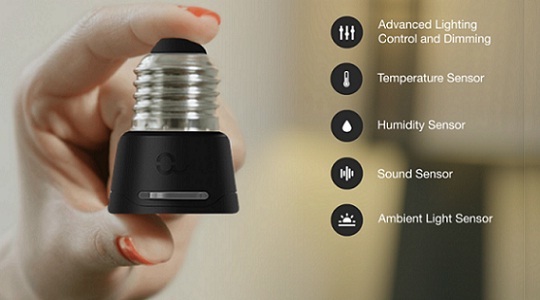 The patent-pending Anyware Smart Adaptor is the world’s smallest and smartest Smart Home system in ONE connected device. It can smartly detect sound, temperature, and humidity through its latest sensors, and can be configured to deter and detect intrusion attempts based on the sound detection. It monitors temperature and humidity levels in the room and functions as its own WiFi and Bluetooth (BLE) gateway. It is designed to enhance daily routines with pre-configured Smart Home services in the Anyware App. It has sound-based intrusion detection, randomized home occupancy light to deter intrusion attempts, indoor climate monitoring to keep your home healthy, and energy saving mode that saves you energy by turning off light when no-one is at home. It also features light dimming functionality for supported LED light bulbs including E26 lamp sockets, Supports E12 (Candelabra) LED only light bulbs, dimmable and non-dimmable, up to 10Watt.